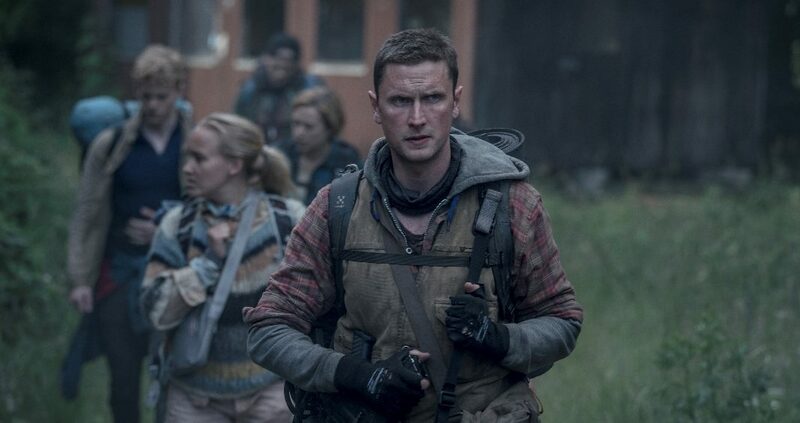 The Rain Review - Netflix Delivers Another Foreign Must Watch - Are You Screening? The Rain kicks off with a series of events that is by now so commonplace that it makes it difficult for the post-apocalyptic wonder to properly set the tone and mood. Luckily, once Simone (Alba August) and her younger brother, Rasmus (Lucas Lynggaard Tønnesen) enter the doomsday bunker the series begins to realize its potential. As the fascination with the end of the world, whether by disease, catastrophe, or zombie horde, locks its grip on the current cultural consciousness, it becomes harder and harder to effectively get to the meat of the matter. The Rain struggles to establish its particular spin on things without becoming boring, but mostly because it’s railing against so many efforts that came before, and it can’t figure out a way to say the same old things in a way that feels fresh. Mostly, it just decides not to bother. Average-ish teen Simone wanders through her day so that we can become convinced that she is average-ish, but is soon swept away by her father who blathers on about the rain that is coming. This hardly seems like something to cause a panic. With her mother and brother also in tow, Dad dumps his family in a bunker and quickly declares that he must leave. The rain, it seems, spreads a virus that kills everyone, and before long we lose Mom as well. Now Simone must figure out what to do with her brother, who is perhaps nine or ten at the beginning of our adventure. It turns out that Dad worked for some research company, who made not just this bunker, but indeed dotted the landscape with them. Six years later, Simone finally decides that no one is coming for them and, since they’re running out of food, they are going to have to make for the other bunkers in order to survive. They will possibly find out what’s going on along the way. 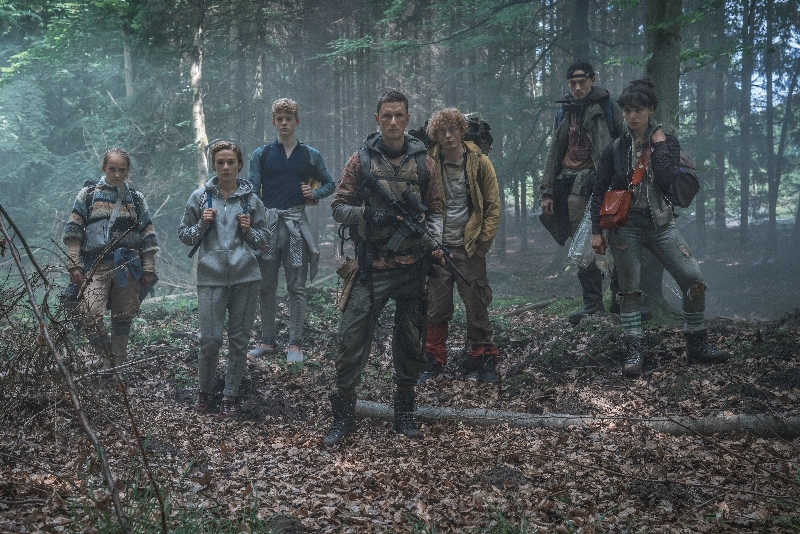 On exiting their bunker, the siblings are met by a ragtag group of young people led by Martin (Mikkel Boe Følsgaard), who have been wandering nomadically throughout the countryside simply hoping not to get wet, or picked up by The Others, a heavily-armed military force that apparently rounds people up and disappears with them. The adventure begins with our group hoping to find other bunkers and get some clue as to what happened to the world. As it turns out, Simone and Rasmus’ father might know quite a bit about what’s going on, and Rasmus might be the key to saving those who are left alive. Unfortunately, there aren’t a lot of friendly strangers in the world, and it rains a lot, so nothing is going to be easy. That’s before you factor in the idea that a group of people thrown together to survive don’t necessarily get along well. The Rain delivers an authentic intensity throughout the trek through the unknown that reminds of the best moments of things like: The Walking Dead, Stranger Things, and even Netflix’ other foreign thrill ride, Dark. Though the show is almost custom-made to simply churn out overused plot devices and cliched, wooden characters, it instead opts for a level of realism that might almost seem boring in the script. Our little group spends a fair amount of time befuddled, unsure, and even in shock, which is a tricky way to progress a plot, but does a better job of grabbing hold of its audience. Characters may do foolish things now and again, but they feel like foolish things that are true to the character and situation, instead of just the dumb thing that had to happen to get to the next scene. August and Følsgaard are freakishly watchable and so long as the show doesn’t stay away from them for long, they are as good as a book you can’t put down in themselves. It isn’t ultimately the greatest story, though it hints at a second season that might get especially wild, but it isn’t quite about what it’s about anyway, and in the most engrossing sense. It’s about figuring out these people, complete with flashbacks to their pre-Rain lives, and witnessing their effort to cope. It’s also the kind of delivery that makes you wonder if perhaps a great many scenes weren’t improvised, and if you wonder if that’s true, it doesn’t matter if it’s true. Possibly the best statement one could offer about the show is just that you never really wonder about the rain, the plague, or the great mystery behind events generally, even at those times when the characters are most focused on tackling such questions. You’re too involved for the bigger picture. What has this life made of Simone, or Martin, or Rasmus? That’s all you want to know.